This month marks the official start of the 2017 ozone season. 22 eastern U.S. states will have to comply with much tighter emission budgets than over the last two ozone seasons. Emission budget reductions for CSAPR states, required by the EPA as part of the 2016 CSAPR Update Rule, have created very delicate market conditions that could drastically influence our outlook for emission allowance prices. On September 7, 2016, the EPA finalized an update to its Cross-State Air Pollution Rule (CSAPR) ozone season program. 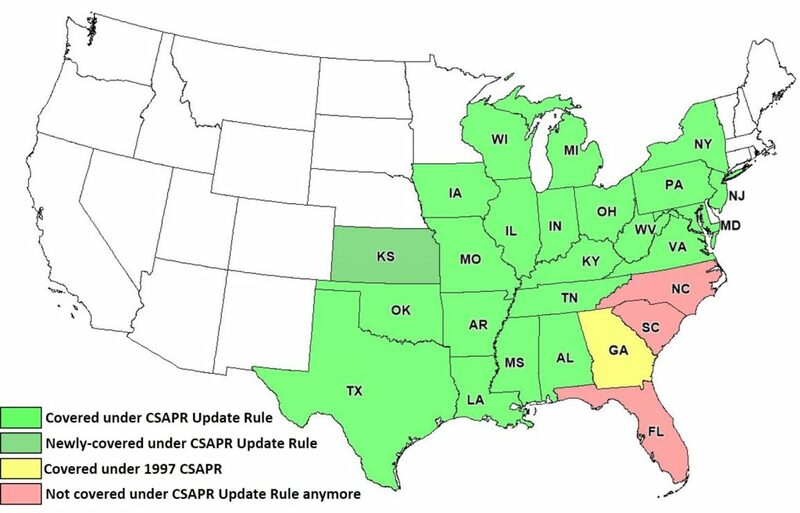 The CSAPR Update Rule adjusts state budgets to maintain the 2008 National Ambient Air Quality Standard (NAAQS) for Ozone (75 ppb). Exhibit 1 shows the 22 states covered under the CSAPR Update Rule. Updated emission modeling has shown that NC, SC, and FL no longer contribute significantly to ozone levels in downwind states and are therefore excluded from the CSAPR Update Rule. Emission budgets under the CSAPR Update Rule are almost exactly half of the emission budgets for the last two ozone seasons. 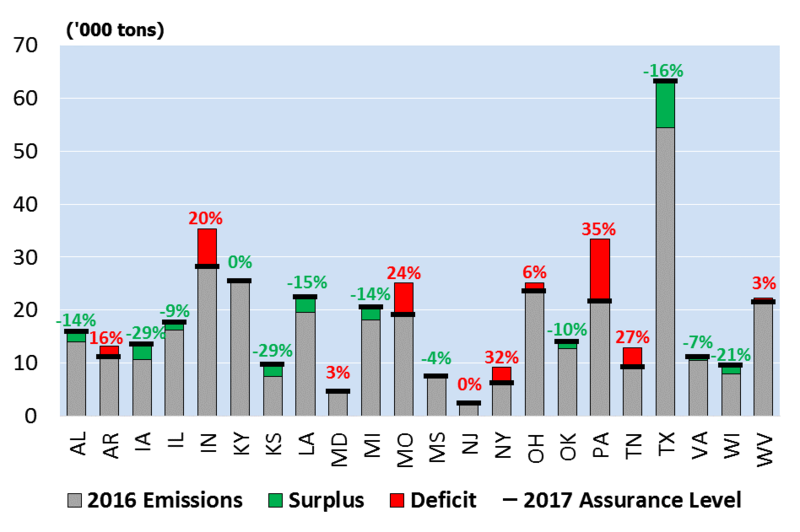 Exhibit 2 shows the final 2017 CSAPR state budgets, each state’s NOx emissions during the 2016 ozone season, as well as the exceedance of 2016 emissions over the 2017 state budgets. While some states have already achieved (or are very close to achieving) the 2017 emission limits, others, such as Pennsylvania, will be required to reduce their NOx emissions significantly. Also, while a state as a whole might be well below its target emission budget, fossil fuel generation owners within that state might still need to buy allowances to cover excess emissions beyond their allocated and banked allowances (e.g., Luminant in Texas, DTE Electric Co. in Michigan). 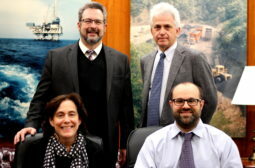 Historical trends in emission markets and the design of the CSAPR market itself have shown that it does not behave the same way other trading markets do (e.g., NYSE). The frequent rule modifications and other complexities make it exceedingly difficult to predict market prices. Will NOx emission control equipment (e.g., SCRs) that was idled over the past few years be returned to full operation for the 2017 ozone season? Some owners who either have a significant amount of carryover allowances or are themselves projecting to need less than their allocated allowances could decide not to run their SCRs and therefore not be creating the surplus allowances our model is currently projecting. Should everyone continue to operate their emission control equipment the same way they did the last two ozone seasons, the market will be significantly short of allowances. How will natural gas prices vary over the summer? As we have seen over the last two years, coal and gas are now in constant competition for market share. Any change in dispatch cost for gas units due to changes in Henry Hub natural gas prices can have a significant impact on coal generation and therefore NOx emissions. For example, higher natural gas prices would result in more coal generation and therefore more NOx emissions, resulting in a tighter CSAPR market with higher allowances prices. What will be the demand for fossil fuel generation this summer? In EVA’s hourly power dispatch model, we assume average summer weather of the last 15 years, with the weather being the primary driver for electricity demand. Also, any increased renewable generation above or below normal patterns will have a significant impact on what share of electric generation will need to be met by fossil fuel units. For example, a hotter than average summer with lower than average renewable energy output would result in more need for generation from fossil fuel units and therefore higher than currently projected NOx emissions, resulting in a tighter CSAPR market with higher allowance prices. 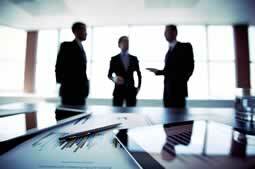 What will be the market participation of various stakeholders with compliance obligations under the CSAPR Update Rule? Many regulated utilities with surplus allowances are highly unlikely to sell allowances due to the lack of financial incentive (any revenue from the sale would go back to the ratepayers, not the shareholders) and future compliance uncertainty (banked allowances reduce future compliance risks). This subgroup of regulated utilities accounts for almost half of all surplus allowances created in 2017 on an owner level. Municipalities with only a small allowance surplus are also considered unlikely to trade due to the effort barrier. Independent power producers and electric cooperatives are most likely to participate due to the direct revenue impact of the sale of their surplus allowances. Under existing program rules, the EPA allows for 98,793 allowances to carry over from 2016 into 2017. Allowances currently held in facility accounts located in the 22-covered states, facility accounts located in the three states no longer covered (i.e., FL, NC, SC), and allowances held in general accounts, are being converted at a ratio of approximately 3.3 to 1. These 98,793 allowances (and how many of those will be available for sale) will have a significant impact on the overall market liquidity. Some of these will be used by owners with projected annual deficits for this year to cover their projected emissions. As mentioned earlier, regulated utilities with projected annual surplus allowances will likely hold on to their carryover allowances and not offer them for sale. That leaves about 55,000 of the 99,000 carryover allowances probably available for sale. However, 11,000 of the 55,000 allowances are being held either in facility accounts in FL, SC, or NC, or in general accounts of companies with no compliance obligations (e.g., South Carolina Gas & Electric, Florida Power & Light). Should these 11,000 allowances not be available for sale, that could increase the number of allowances likely to be for sale to be actually sold from 26% to over 30%. For more information on this topic, please contact Phillip Graeter at [email protected] or subscribe to our NEW Quarterly Environmental Report. The report offers a complete, yet concise, overview of the U.S. environmental markets – a one-stop solution that provides the latest information regarding U.S. environmental policies, regulations, and emission markets.